Hello, when I click on "reidentify layer tiles .."
Some tiles are not identified. These tiles exist in the tileset but are not identified. How can I make these tiles identified? 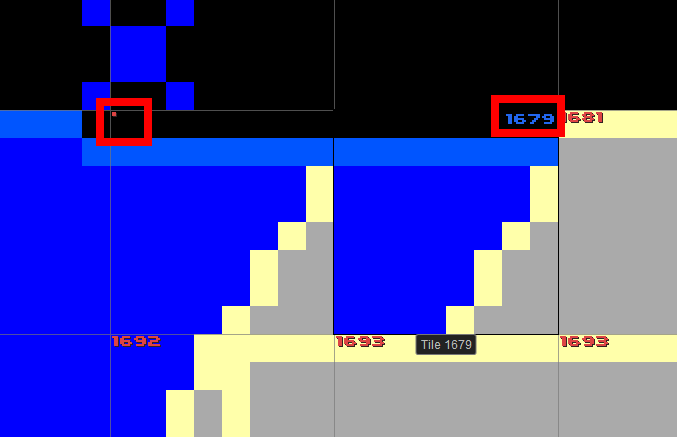 In this image you can see that a tile that I have on the tileset (1679) is not being identified and the symbol "." If you tell me to press ctrl + click to add the tile to the tileset, this is a lot of work because there are many tiles that are not being identified and I would have to move many tiles in the tileset. The problem is that the black color is different value in some tiles. I have the same problem but worse, in my case the function "Reidentify layer tiles" only identifies 5% of the tiles, more o less. I use the same palette and I am checked that the tiles are the same. In fact, if I unmap any tile on the canvas and then try reidentify, it fails too. @Haplo, could you send me a document with this problem that I can use to reproduce it? Yes, of course. I send you a pm right now. Hi, any progress about that? I just back from holidays and I have a lot of ideas to draw! It is strange, I tried almost all PyxelEdit versions but the function "Reidentify mosaic layers" does not work well in any of them, or the command simply is ignored. Can someone confirm that the feature works in his case? My project is stopped because of this and I am seriously thinking to program of my own level editor. The test is easy to do: simply do right click over a tile (in the tiles window) and select "Remove references in layer". Then select "Reidentify layer tiles" in Tiles menu and check if the ID is the same or null "." Hi Haplo, sorry about not getting back to you about this. I debugged the problem using your test file and I have identified the bug. I will PM you a link to a build you can test to verify the fix.